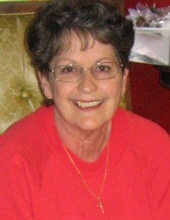 Peggy Handshoe Williams, age 70, of Louisville, Kentucky, formerly from Knott County, passed away Thursday, March 21, 2019 at the Hazard Appalachian Regional Medical Center. She was born at Hindman, Kentucky on November 6, 1948 to Fred Handshoe and Madeline Stamper Handshoe. Parish Life Director at Mother of Good Counsel Catholic Church, and be held at the Hindman Funeral Services Chapel at 11 AM Monday, March 25, 2019. Burial will follow at the Mountain Memory Gardens at Hindman, KY. Visitation will be held at the Hindman Funeral Services from 2-8PM Sunday, March 24, 2019. "Email Address" would like to share the life celebration of Peggy Handshoe Williams. Click on the "link" to go to share a favorite memory or leave a condolence message for the family.